Before the internet, protesters lacked social media’s networking capabilities that allow movements to coordinate and share information in real time. But now, movements have the ability to grow so rapidly that they skip preparation stages that are often vital to movement success. 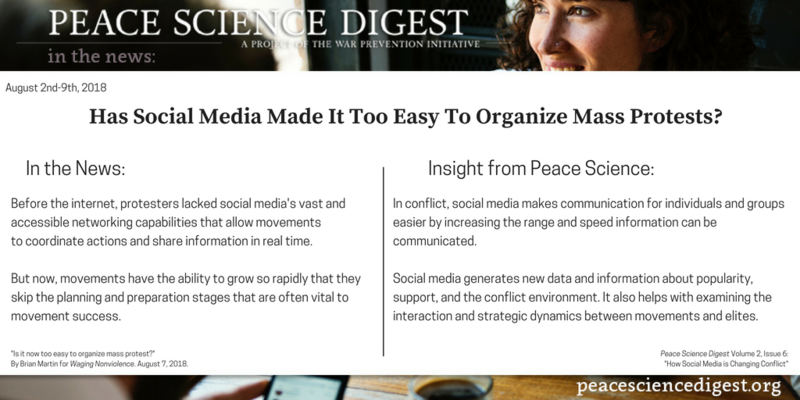 In conflict, social media makes communication for individuals and groups easier by increasing the range and speed information can be communicated. Social media generates new data and information about popularity, support, and the conflict environment. It also helps with examining the interaction and strategic dynamics between movements and elites. “Is it now too easy to organize mass protest?” By Brian Martin for Waging Nonviolence. August 7, 2018.